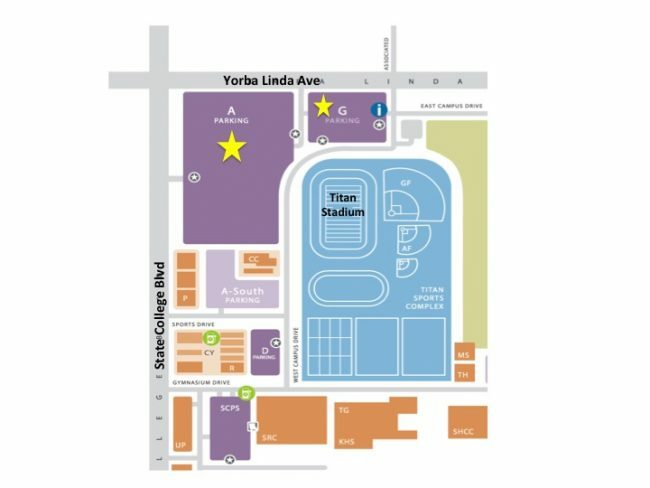 Parking is available for free in Lots A and G on match day. No tailgating will be permitted. All guests will be subject to bag checks. Weapons of any kind. Any object that can be considered or used as a weapon is not allowed inside the stadium. Factory-sealed plastic bottled water, 20 oz. or less (limit two per person), are allowed into the stadium. Objects with sharp edges or tips, including all metal and hard plastic costume accessories, are not allowed inside the stadium. Helmets and plastic head wear are allowed providing the item does not resemble the definitions above. Seat cushions are permitted but cannot contain any pockets, zippers, compartments or metal. Other items that are prohibited from entering the stadium include, but are not limited to: Sticks (including selfie sticks), Inflatable objects, Laser pointers, Flammable objects, Stun guns, Fireworks, Lawn furniture, Spray bottles, Sports bottles, Beach balls, Frisbees, Musical instruments, Boomerangs, Knives, Mace and pepper spray, Chains, Balloons, Sports balls, Water guns, Rollerblades, Skates, Scooters, Noise-making devices, Umbrellas. 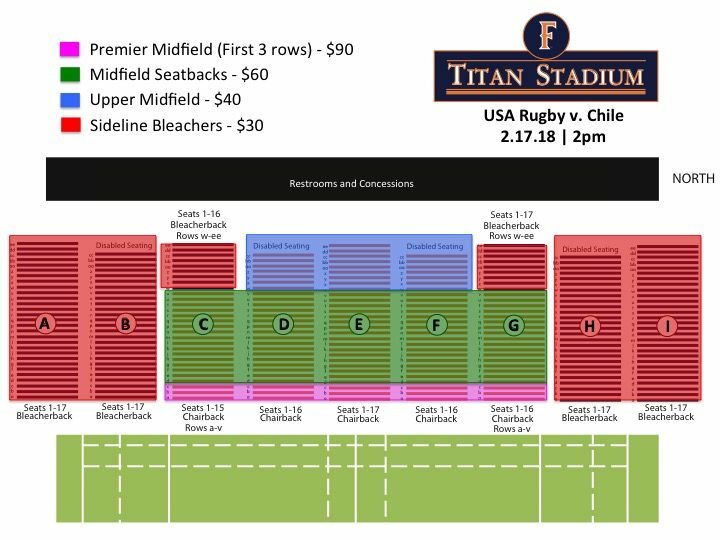 LAFAYETTE, CO. - USA Rugby announces final ARC home match with Chile at Titan Stadium at Cal State Fullerton on Feb. 17. Beginning at 2 PM PT and featured LIVE on The Rugby Channel. Pre-sale tickets for each event will become available on Monday Dec. 8, with registration for the pre-sale list available on usarugby.org/tickets. The contest brings a Chilean squad who returns with confidence, having just ended their 2017 season climbing four spots in the World Rankings after their defeat of Germany and rising from No. 28 to their now No. 24 position. Looking to build on momentum, the Condors will hope to avoid a third consecutive loss to the prevailing champion United States, finishing the 2016 ARC in 6th place with an overall record of 1-9 in the tournament. Audiences at Cal State Fullerton will see a Chilean team hungry to continue their growth and an Eagles squad prepared to make another impressive stance. "Chile always brings a strong set piece and our forwards will need to come ready for the challenge," says Hodges. "We are looking to put on our best performance at Cal State Fullerton for our final home match of the ARC." Having finished the 2017 season on a high note themselves, the Eagles are primed for competitive matchups, boasting their own win against Germany (46-17) and falling just shy of a November test sweep, with a 1-point loss to No. 12 Georgia. The United States and Chile will both make their third appearance in the 2018 Americas Rugby Championship with the Eagles competing in three consecutive home contests, beginning with International Rugby Saturday against Argentina XV at StubHub Center on Fri, Feb. 3 at 8 PM ET. Shortly followed by USA vs Canada in Sacramento on Feb 10. The exclusive ticket pre-sale for the USA vs Chile match begins Monday Dec. 8, and will be followed by a public on sale date to be announced at a later time. Fans may sign up for the Eagles' pre-sale list on usarugby.org/tickets, subscribe to The Rugby Channel to watch both matches LIVE as well as follow @USARugby on Twitter for updates.